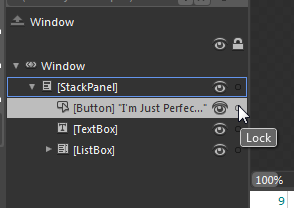 When you’re working in Blend to design your user interface, you’ll often spend a lot of time setting properties for controls to get them to look just the way you want them. Once you get a control set the way you want it, you can lock it to prevent inadvertently changing it as you work with other controls in your user interface. To lock a control, left-click on the small circle at the far right of the line representing your control in the Objects and Timeline panel. Once you click on this lock icon, the circle will change to look like a little lock. At this point, you won’t be able to change the control from the artboard or the Properties panel. You can also no longer select the control in the Objects and Timeline panel. 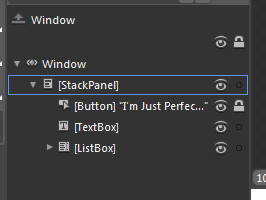 You can still change properties of the control, however, by editing its XAML directly.